For a number of years in the past, I reported on the Wine & Heart Health Summit held in various wine regions in California and Oregon. I attended the first meeting, held in 2001 in Napa Valley. Regular attendees became members of the Renaud Society. That event is no longer conducted and has been replaced by the Wine and Health international conference that brings together world experts for the exchange of scientific information on the impact of wine consumption on human health. The scientific committee for that event includes American doctors R. Curtis Ellison, Professor of Medicine and Public Health at Boston University School of Medicine, Tedd Goldfinger, a cardiologist in Tucson, Arizona, and Andrew L. Waterhouse, a well known wine chemist who is a Professor of Enology in the Department of Viticulture and Enology at University of California at Davis. 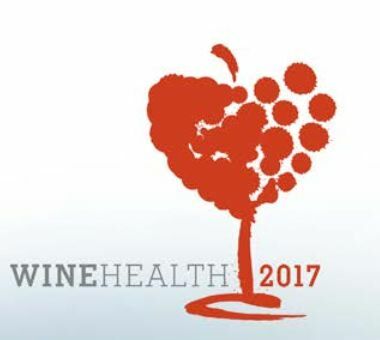 WineHealth 2017 was held February 16-18, 2017, in Spain: www.winehealth2017.com. The conference is based on the epidemiological evidence that moderate red wine consumption is inversely associated with a decline in cognitive function and seems to exert cardioprotection and reduce the prevalence of the metabolic syndrome (a combination of risk factors that occur together and increase the risk for coronary heart disease, stroke and type 2 diabetes). Some studies favor ethanol effects alone while others support the contribution of wine micro-constituents in combination. I have summarized the important presentations and research studies that were part of WineHealth 2017, and tried to describe them in terms the lay public can understand. This summary provides the interested reader with an understanding of the most current alcohol, wine and health research. 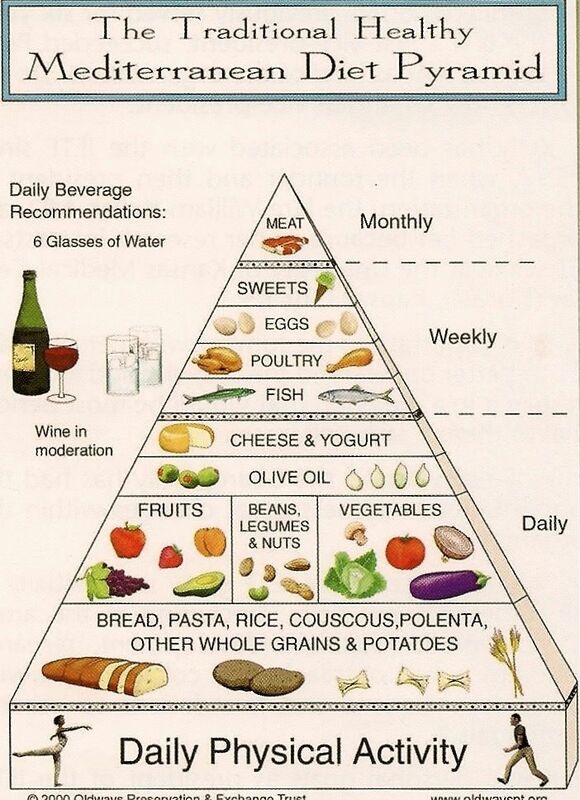 “Wine, Mediterranean Diet and cardiovascular disease. Lessons from the PREDIMED trial” Dr. Ramon Estruch, University of Barcelona, Spain, and CIBEROBN, Spain. Dr. Estruch started the PREDIMED study in 2003 to evaluate the effects of a Mediterranean diet on the primary prevention of cardiovascular diseases. The main results have been published in several medical journals. The PREDIMED trial has demonstrated that an increased adherence to the traditional Mediterranean Diet is associated with reduced incidence of cardiovascular events. Participants in the trial with a low incidence of cardiovascular disease and stroke were those with higher consumption of wine, extra-virgin olive oil, coffee and walnuts, all foods rich in polyphenols. One PREDIMED trail showed that wine and beer, fish and legume intake were found to be particularly responsible for the Mediterranean Diet benefits on HDL (good cholesterol) function in a random sample of high cardiovascular risk volunteers following a Mediterranean Diet. In another PREDIMED trial, it was found that light (less than 5 grams of alcohol per day) and moderate (5 to 15 grams of alcohol per day) consumers of wine and specifically red wine, showed a 38% reduction of all-cause mortality. Moderate and high (more than 15 grams to 70 grams of alcohol per day) wine consumers exhibited a 30% to 70% reduction, respectively, in the incidence of major cardiovascular events. This higher effect of red wine compared to other alcoholic beverages has been attributed to its high polyphenol content. “Update on the J-shaped curve: where are we now?” R. Curtis Ellison, M.D. Epidemiological studies have consistently shown that, when compared with non drinkers, light-to-moderate consumers of alcoholic beverages have a lower risk of cardiovascular disease and also a reduced risk of other diseases and total mortality. Heavy-drinking subjects show a greater risk than non-drinkers and moderate drinkers. This phenomenon results in what is known as the “J-shaped curve.” The J-shaped curve has held up in most recent, high-quality studies when only lifetime non-drinkers make up the non-drinking category. Experimental studies in animals have shown a similar pattern: a decrease in risk with light or moderate exposure to alcohol, and increased risk with high exposure. Unfortunately, most epidemiological studies have not adequately controlled for the pattern of drinking even though it is known that regular moderate consumers of alcohol have clear health advantages over binge drinkers of the same average amount of intake. It is anticipated that when more accurate assessments of actual alcohol consumption and drinking patterns become available (rather than the average amount of alcohol consumed over a week or month), even greater protection against disease from moderate drinking will be shown, especially when the beverage of choice is wine. A large meta-analysis (a statistical analysis combining the results of multiple scientific studies) provided evidence of a J-shaped relationship between both regular wine and beer intake and non-fatal vascular risk, with maximal protection at moderate consumption of around 25 grams per day of alcohol. A standard drink in the United States is any alcoholic drink that contains about 15 grams of alcohol, equivalent to about 5 ounces of table wine or 12 ounces of 5% alcohol beer. Such protection was not seen when drinking beyond moderation or more than 30 grams of alcohol per day or binge drinking. A statistically significant association between spirits intake and vascular disease could not be found. A J-shaped curve was also confirmed for total mortality, with 25% maximal risk reduction at approximately 10 grams per day and significant protection up to 40 grams per day of alcohol. The finding of an inverse association between the consumption of wine or beer in relation to cardiovascular outcomes may be reasonably explained by a combined effect of alcohol and of different but similarly beneficial polyphenols contained in either beverage. It is speculated that consuming wine or beer, especially during meals, favors synergistic effects between alcohol and polyphenols contained both in wine or beer and in other components of the Mediterranean diet. “Effects of alcoholic beverages such as wine on lipid and other biomarkers for cardiovascular disease” Dr. Henk Hendriks, Hendriks Nutrition Support for Business, Zeist, The Netherlands. Healthy lifestyle factors like non-smoking, physical activity and a healthy diet are associated with a decreased risk for mortality and metabolic disease. 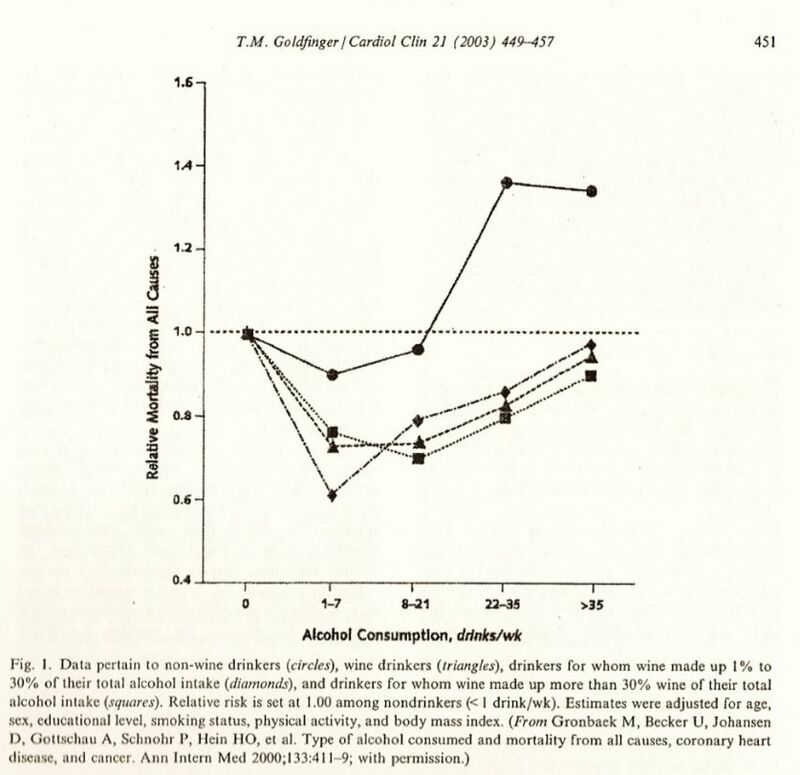 It appears that a risk reduction in cardiovascular disease due to moderate alcohol consumption is additive to the beneficial effects of other healthy life style factors. The main processes that are beneficially affected by moderate wine or alcohol consumption with regard to cardiovascular disease are lipid (cholesterol) metabolism (an increase in good cholesterol or HDL and functioning), blood clotting (decrease in fibrinogen) and glucose metabolism (decrease in HbA1c). These processes combined may explain the larger part of the reduced risk for cardiovascular mortality associated with moderate wine consumption. A randomized prospective clinical trial showed that the alcoholic and the non-alcoholic fraction of wine, rich in polyphenols, may reduce circulating endothelial cells (CEC), a marker of cardiovascular severity, and increase endothelial progenitor cells (EPC), a marker of vascular endothelial regeneration in a population at high risk of cardiovascular disease. These features may explain why de-alcoholized red wine and moderate red wine consumption reduce cardiovascular risk, suggesting an improvement in the condition of the vascular endothelium (lining) and possibly delay in development of atherosclerotic plaques. A study of an elderly Mediterranean population (cohort) at high risk for cardiovascular disease showed that light and moderate consumption of alcoholic beverages, mainly red wine, was inversely associated with total mortality and major cardiovascular events. In Mediterranean countries such as Spain, moderate wine drinkers show a higher adherence to the Mediterranean Diet than beer or spirit consumers, and predominantly wine consumers showed lower body weight than beer and spirit consumers. Researchers at the University of California in Los Angeles published a study in the journal Experimental Gerontology that showed that the polyphenols such as resveratrol in grapes can promote brain activity in patients with early onset cognitive decline. The study involved five elderly men and five elderly women who had a mild decrease in cognitive function for at least six months. Half of the study participants took a daily placebo and half a freeze-dried powder made from California red grapes (equivalent to three standard servings of grapes or one and a half glasses of wine). Several studies were conducted at the onset of the study and after six months of treatment, including brain PET scans that measure metabolism in different regions of the brain. The regions of the brain that are found to have less activity in early Alzheimer’s Disease also became less active in the subjects on the placebo, but those who received the grape powder had no significant decrease in brain metabolism. Obtaining maximum health benefits from moderate consumption of alcohol critically depends on the pattern of drinking. A review published in 2016 in the journal Food and Function, looked at past studies and seven measures of drinking patterns. They concluded that wine drinkers have a lower rate of mortality than those who regularly drink beer or spirits. It was also evident that the cardioprotective effects of wine increase when it is consumed with a well-balanced diet.